How can anything so small produce something so big ?! This succulent, commonly known as "pickle" is all of 2 inches high and produced this large, gorgeous pink bloom this week. 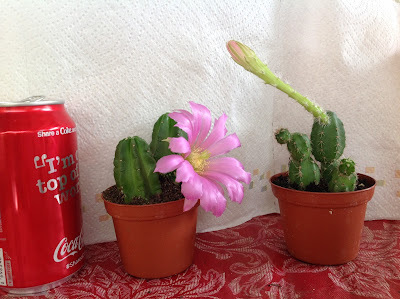 The plant on right is the same thing so you can see how it looks before blooming..simply amazing ! I put a Coke can in the pic for perspective to show you the size. That's just an example of amazing little wonders that happen around our place ! We had a great weekend at Punta Gorda with great sales, and super supportive crowd and good times with fellow vendor friends. We love the town of PG - it has always been sort of a good luck charm for us, so thanks to the many that came out. Also, we met the manager of the local area Farmers Market who would love us to come down and participate..so, stay tuned about that possible news. The next 2 weekends signal the end of another wonderful Sat. Morning Market regular market season before we start summer market immediately at Williams Park, downtown St. Pete June 4th. This time of year, we always like to recap, recount, remember and rejoice at our fortunes - in a way, the end of May is our New Years Eve, and Oct. 1, 2016, the start of the 14th season of St. Pete Market, is our New Years Day. Just like the little succulent above, our beloved city Market has grown from a very small entity to producing beautiful things over the last 13 years, just like Armstrong Nursery has grown over the same time and although, still small in our own way, we love to keep producing big things. We cannot do it without the love and support of thousands of customers, beloved market friends and plant lovers everywhere, so many Thank Yous to everyone that follows us on our blog, visits our markets, visits our shows, and keep us going! Just because it's the last 2 weeks, doesn't mean we are slacking off ! We will keep bringing great plants at great value to you at market all the time and we keep thinking of new things and new ways of doing it all better. For instance, going into Summer Market time, we will keep having a great selection of those mini succulents, Air Plants and summer hardy perennials and bushes. Annie is setting things up so that she can do workshops at market to do succulent planters and perennial bowls. The slower pace of summer market allows us and our customers to have the time to learn about age old things as well as new developments in the plant world - we can't wait !